Happy Chanukah to the Aitz Chaim Community! As Asher and I lit the candles these first few nights, we reflected on how beautiful the light is on these, the darkest days of the year. I count it as a blessing that in this cold and dark time, we are asked to light up our homes with the chanukiah (Chanukah menorah), reminding us of the miracles wrought by and for our ancestors. 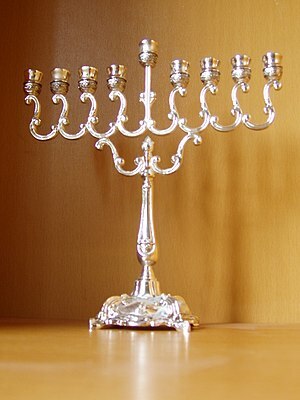 Chanukah is a holiday celebrating the rededication of the Temple in Jerusalem. At that time, the Temple in Jerusalem was the place of God’s Presence on earth. The Temple was only able to be rededicated after the people cleaned it and prepared a place for God to dwell among them. Today, we understand that God’s Presence can fill our world. What part of your life would you like to rededicate for God’s Presence to dwell with you? I wish you all a Chag Urim Sameach – A Happy Holiday of Lights! May the light of your chanukiah pierce the dark and cold of these days and bring warmth and blessing into your homes and the whole community. Posted on December 22, 2011, in December 2011 and tagged Hanukkah. Bookmark the permalink. 3 Comments.